I will admit to a lot of disappointment in this book. I really wish I had read a few reviews before requesting this book and its two sequels. Then I would have probably not cost my sponsors at MX Publishing the cost of the trilogy. There was Solar Pons, written at first as Sherlock Holmes stories before August Derleth was asked by Doyle to change the hero. Pons became an enduring detective in his own right, with Basil Cooper continuing the tales. There was Sexton Blake, and I am unsure of just how many stories have been written about him, but the volumes I have do not touch the stories written! 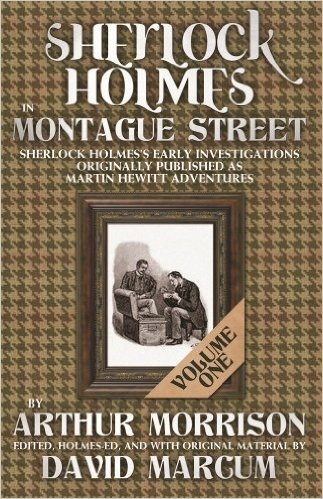 Then there was Martin Hewitt, written by Arthur Morrison, which had the advantage of gracing the pages of the Strand when a Holmes story was not available. Hewitt a man who solved by logic the problems presented, but also depended on his personality, being quite the people person while maintaining his status as a loner. Hewitt was not the man who would find a lifelong friend and roommate. He would be friendly to all, but his home was HIS castle.